Transgenics are truly children of the stars. They are the offspring of a human and an alien race, with either an alien father and human mother or an alien mother and human father. Sometimes this resulting offspring may have been the result of a magical rather than a natural union, even though they are still able to mate with other transgenics and other races. Transgenics often call themselves a “brood.” Some choose to live with human family, but often, their alien ancestry is unknown, which often motivates them to learn more about their alien side. Thus, transgenics tend to be explorers searching to find out more about themselves and their lineage. What they do at the end of this search depends on the transgenic, but if the cause of their existence was an unwilling union, they might choose to take revenge on that parent. At the core of what makes a transgenic, is they just want to explore the different aspects that make them themselves. Ability Adjustments: +2 Str +2 Int -2 Con. Transgenics have superior strength and intelligence, but the combination of their bloodlines has made them sickly. Languages: Transgenics speak Common and Aklo. Transgenics with high Intelligence scores can choose from the following: Aurellian, Common, Dwarven, Elder Thing, Elven, Manu, or Pasimachus. Transgenics are humanoids with the transgenic subtype and are Medium creatures. Transgenics can see up to 60 feet in the dark. Transgenics gain a +2 racial bonus to Acrobatics and Survival. Transgenics can survive in the void of space longer than normal humanoids. Their body adapts to allow them to survive by slowing down their breathing for 10 minutes per point of Constitution modifier (minimum of 1 minute) beyond the normal rules for survival in the void. Transgenics may mentally communicate with a single creature within 50 ft., but otherwise, this ability is identical to the telepathy ability. They may use this ability for a total of one round per day per character level. These rounds do not need to be consecutive. They appear to be mostly human, but no matter how usual the body of their alien ancestor, transgenics will have humanoid body shape including one head with two eyes, one nose, one mouth, two arms, two legs, ten fingers, and ten toes. However, their skin color tends to favor their alien ancestry with hues ranging from blue, green or even red. Their eyes closely resemble human eyes, but the shape of the iris tends to more elliptical rather than circular and the colors of their eyes can be literally any color including blue, green, red, brown, gray, black, orange, etc. A transgenic’s hair can range anywhere from bald to full, straight to curly or even naturally spiky, and will often have unusual coloring such as bright crimson red or lime green. They are normally around five and a half feet tall and weigh about 130 pounds. As a half-race, transgenics do not have a homeworld of their own. They must live within other societies and adapt to them, which like other half-races, forces transgenics to remain versatile. Because they are usually more familiar with other races of the void, many transgenics are able to act as diplomats between planet-bound races and space traveling races. However, there are some very rare colonies that consist entirely of transgenics, usually made of outcasts or transgenics tired of dealing with other races. 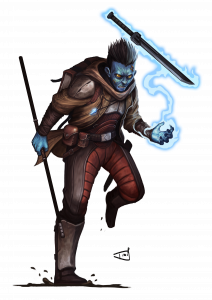 Transgenics see themselves as a “half race”, so they find themselves most at ease with other half races including half-elves, half-orcs, aasimar, and tieflings. These “half races” do share a kinship with transgenics as well. Transgenics are courteous to “full races”, but are cautious when making commitments, such as adventuring with them. Of all the other races, they get along best with humans and halflings. Their relations with dwarves, elves, and gnomes is tenuous at best. Transgenics may be any alignment, however, most tend to be some sort of neutral. If their ancestry is known, some transgenics might attempt to emulate their alien ancestor’s behavior and thus have the same alignment. Transgenics tend to worship the gods of the void, feeling more comfortable with those that respect space and the void. Some transgenics are known to worship the insane elder gods. Searching for answers to their alien heritage draws many transgenics out adventuring. Some search to find their ancestors or others of their ancestral race, while other could care less and adventure for gold or for adventure itself. They enjoy traveling to new worlds to experience all that the universe has to offer, but they typically do not stay long, yearning for the next adventure, traversing the starways and can often be found working in dockyards as engineers aboard a vessel, or as pioneers in search of a habitable world upon which to found a colony. Many transgenics do establish a home, stronghold, or even space station if they find a place that makes them happy. The following racial traits may be selected instead of the standard racial traits for transgenics. Consult your GM before selecting these options. Alien Resistance: A transgenic with this trait may select one type of energy: acid, cold, electricity, fire, or sonic, and gain resistance 5 to their chosen energy type. Once this choice is made, it can never be changed. This trait replaces void survival. Diplomat: Transgenics are skilled in negotiations and dealing with other races whether they be planet-bound or starfaring. Such transgenics gain a +2 racial bonus to Diplomacy checks. Their long days at well-lit negotiation tables have cost them some of their ancestral dark vision though. This trait replaces darkvision. Humanlike: Some transgenics have extremely distant alien ancestry. A transgenic with this racial trait counts as a humanoid (transgenic) and a humanoid (human) for any effect related to race, including feat prerequisites and spells that affect humans. She can pass for human without using the Disguise skill. This racial trait replaces racial skills and alters the transgenic’s subtype. A transgenic’s subrace can modify the abilities that they possess, based upon the nature of their alien ancestry. Alternate Racial Skills: While most transgenics gain a +2 racial bonus to Acrobatics and Survival checks, those of the subraces listed below gain a modifier to different racial skills. Alternate Ability Modifiers: The listed ability score modifiers replace the standard transgenic ability score modifiers. Lantern-progeny feel the pull of their ancestors urge to create things and tinker others’ lives. Like their anunnaki forebears, anunnaki-brood have stony gray skin, high foreheads, and dark, sunken eyes. Those who gain the gift of flight grow mechanical-looking wings like their forebears. The anunnaki-brood often feel an urgent need to create; be it offspring, some work of art, construct a building, or even something as simple as farming. So long as they can see tangible progress, they find contentment in their work. Regardless of where they can be found, most come from worlds where anunnaki have visited and steered the course of evolution. Racial Skills: Anunnaki-brood gain a +2 racial bonus to Heal and Knowledge (any one) checks. Alternate Transgenic Flyer Feat (Ex): Mechanical-looking wings sprout from their shoulder blades. Hundred-eye-progeny are smart and light on their feet. Aatheriexa-brood share the pink colored skin of their alien ancestor. Because their humanoid form is so different than that of their ancestors, some hundred-eye-progeny feel they are trapped in their bodies. These haughty descendants of the Old Ones are known to live amongst other species, flaunting their power and dominance over others. Cthulhu-broods have green skin and their hair grows into deadlocks, whether it is on their head or if they grow a beard. Some are known to develop draconic-like wings. Octopus-progeny often share their ancestors view that they are better than other lifeforms. Some Cthulhu-brood have eerie callings to worship Cthulhu. Racial Skills: Cthulhu-brood gain a +2 racial bonus to Intimidate and Swim checks. Alternate Transgenic Flyer Feat (Ex): Draconic wings sprout from their back. Barrel-progeny are descended from Old Ones and have the stamina to survive longer than others in extreme situations. Elder thing-broods have pink-gray skin like their ancestor. They share their ancestor’s interest in life, art, architecture, and war. Many barrel-progeny do not feel comfortable around other living things and have a strong desire to seek out elder things and learn more about the Old Ones. Racial Skills: Elder thing-brood gain a +2 racial bonus to Perception and Swim checks. Elder Thing Fluent: Elder thing-broods begin play speaking Elder Thing instead of Aklo, however, they may learn Aklo as one of their languages gained from high Intelligence. Trance (Ex): As a full-round action, elder thingbroods can put themselves in a trance that allows them to slow their body and bodily functions to a state that enables them to not require food, nor air, for a preset time period up to 2 hours per character level. This replaces individual telepathy. Alternate Transgenic Flyer Feat (Ex): A set of pink wings grow from their back. Probe-progeny are inquisitive oval headed results of alien experimentation. Gray-broods have gray skin, black eyes, and their head is a little bulbous like their gray ancestors. Oftentimes, probe-progeny are the result of a gray ancestor’s experiment. They are seekers of knowledge of any kind, even going to extremes. Gray-broods are known for doing such things as experimenting on other beings or dissecting the monsters they defeat in battle. Racial Skills: Gray-brood gain a +2 racial bonus to Knowledge (any one) and Sense Motive checks. Rifle-progeny are gun carrying roughnecks that will do anything to get the job done. They have a shobhad parent, sharing the same green-gray skin color. Because of their ferocity, rifle-progeny find kinship with half-orcs more than they do with other transgenics. Racial Skills: Shobhad-brood gain a +2 racial bonus to Intimidate and Survival checks. Ferocity (Ex): Once per day, when a shobhadbrood is brought to 0 Hit Points, she can remain conscious and continue fighting, though she must spend a Resolve Point every round to remain conscious, and if her Resolve Points are brought to 0, she dies. This replaces individual telepathy. Bolt-progeny have magic at their fingertips and are not afraid to use it. Witchwyrd-broods have blue-gray skin and some even shave their heads bald to be more like their witchwyrd ancestors. Like their ancestors, they feel the urge to keep their racial identity a secret by wearing clothes that cover their bodies, which may seem odd to others as they also prefer warmer climates. Racial Skills: Witchwyrd-brood gain a +2 racial bonus to Intimidate and Knowledge (arcana, geography, or planes) checks. Magic Missile (Sp): Witchwyrd-brood may use magic missile once a day as a spell-like ability with a caster level equal to their character level. This replaces individual telepathy. Yithian-broods have strange orange skin like their alien ancestors and like the yithians, they enjoy controlling the minds of others. Spherical progeny often seek roles that give the ability to read and control minds, so many become mystics. Spherical-progeny seek to find that little piece of knowledge that will give them the edge to live another day. Racial Skills: Yithian-brood gain a +2 racial bonus to Knowledge (any one) and Perception checks. Yog-Sothoth-broods have purple skin and their hair is usually the same color purple, but black and white hair is also known. The Great Old One blood that flows through them often leads to them feeling superior to other living beings. Squirm-progeny, the legacy of the Great Old Ones, hide within the ranks of other creatures, squirming and writhing. Racial Skills: Yog-Sothoth-brood gain a +2 racial bonus to Athletics and Intimidate checks. Invisibility (Sp): Yog-Sothoth-broods may use invisibility once a day as a spell-like ability with a caster level equal to their character level. This replaces individual telepathy. Zurkhans are a race of space traveling conquerors and often mate with the creatures of planets they have taken over. Zurkhan-brood share their ancestor’s multi-colored red-black-gray skin and depending on their zurkhan ancestor’s caste, one of these colors are more prominent than the others. Gray patches represent a soldier caste, red patches represent caster castes, while black patches are often scouts. Conqueror-progeny are strong, fast, and willing to take what they desire using a combination of brute strength and intellectual superiority. Racial Skills: Zurkhan-brood gain a +2 racial bonus to Intimidate and Sense Motive checks. A xenofilos is an explorer, searching for ways that she can control things with her mind including weapons, the thoughts of others, and even herself. Prerequisites: Only a solarian may take this archetype, and the alternative class features listed below can only replace solarian class features. 2nd-Level: Sidereal Telepathy (Su) At 2nd level, a xenofilos can meditate for one minute in order to use her individual telepathy racial ability for one minute without spending a daily use of that ability. Any transgenic that does not have the individual telepathy racial ability may instead gain one additional use of the ability that replaced individual telepathy. 4th-Level: Telekinetic Weapon (Su) At 4th level, a xenofilos may spend one attunement point (either graviton or photon) as a standard action to telekinetically control a single unattended melee weapon weighing no more than 2 lbs./level within 5 ft./level for up to 1 minute or until the she is no longer in combat, whichever occurs first. She may instead use this ability with her solar weapon, allowing it to attack creatures outside her normal reach (this overrules the rule that solar weapons are dismissed if they leave the hand of their creator). Spending an attunement point in this way may cause the xenofilos to become unattuned. If the weapon goes outside her range or she loses sense of it, the weapon will drop to the ground (or be dismissed, in the case of a solar weapon) and this effect ends immediately. The weapon attacks any opponent within range, as she desires, starting the round that the xenofilos activates this ability. The xenofilos may direct the weapon to attack an enemy as a Standard action. Its attack bonus is equal to her base attack bonus but uses her Intelligence modifier instead of her Strength modifier on attack rolls. If she is not proficient with the weapon, she applies penalties as normal with these attacks. This attack’s damage is equal to the base damage of the weapon + her Intelligence modifier. As a full-round action, the xenofilos may attack once with a weapon she is wielding and once with her telekinetic weapon, applying penalties for making two attacks as if she were attacking twice with the weapon she is wielding. She may not use the telekinetic weapon for both attacks. 9th-Level: Doublestrike (Su) At 9th level, a xenofilos may make two attacks with her telekinetic weapon as a full-round action, reducing the penalty for attacking twice in a round to -2 on each attack (instead of -4). Alternatively, she may make one attack with a weapon she is wielding, as well as two attacks with her telekinetic weapon, applying the normal penalty of -4 to attack rolls for all three attacks. 12th-Level: Telekinetic Volley (Su) At 12th level, a xenofilos may make three attacks with her telekinetic weapon as a full-round action, with each attack taking a -4 penalty as normal. She may also spend an attunement point to telekinetically animate several weapons in a ring around herself for up to 1 minute, granting her a +4 bonus to EAC and KAC. This bonus stacks with that granted by Solar Armor, if the xenofilos chose it. While this ability is active, creatures that successfully attack the xenofilos with melee weapons, unarmed strikes or natural weapons are dealt 3d6 slashing damage. You must be 2nd level or higher to choose this stellar revelation. Unlike other stellar revelations, exploration spell is not tied to either photon or graviton power, and can be used by the solarian no matter their current attunement. This revelation grants you abilities to aid you in your explorations of alien worlds. Choose one of the spells listed below. You may cast it once per day as a spell-like ability. This revelation may be chosen more than once; each time, choose a new spell from the list below, and you may cast it once per day as a spell-like ability.